Not too long ago, people assumed that we would lose our teeth naturally regardless of how we lived. However, older people today are keeping their teeth healthy and maintaining them for longer than before. Maintaining your oral health, and keeping your mouth and teeth clean are essential to being able to eat delicious foods, as well as being able to communicate confidently and clearly to others. Having bad breath or bad-looking teeth make us less confident when socializing with friends and family, or even other individuals, so keeping good oral health is important to living a good lifestyle. As we grow older, we tend to have something called “Dry Mouth,” which is a common side effect of various medications, or simply due to less saliva flowing into our mouth. Some people will naturally choose to chew gum to make their mouth less dry. However, chewing sugary gum will only worsen the dryness because sugar is actually bad for your oral health, and can cause gum disease or other bacteria problems. Chewing sugarless gum is always recommended by dentists. 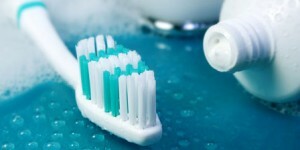 Using normal toothbrushes can be hard in the morning and at night, especially for people with joint or wrist pains. Electric toothbrushes ensure that our teeth are brushed clean and brushed the right way without putting as much strain on our wrists and hand. In fact, because many people don’t brush their teeth the right way, switching to electric toothbrushes actually improves the oral health of most people. If you asked a dentist to choose which habit is more important: brushing or flossing, which would they choose? Most would choose flossing, because brushing your teeth simply can’t reach the places flossing can. Flossing every day prevents buildup of plague and tartar in between your teeth from the food you ate prior, which prevents the development of gum diseases and gingivitis. Sometimes our routines aren’t enough to keep our teeth clean, and sometimes there are problems in our mouth that only dentists can see. Your dentist can provide great advice on other issues and things you can do to better maintain your oral health, especially tailored to your oral conditions.